Our top pick for "nice" weed goes to Chicory. If you are unfamiliar with Chicory, you are not alone. You may have heard of Chicory as a coffee substitute, but what else do we really know about the plant? If you take up an herb cookbook, chances are pretty good you won't find a recipe that has chicory in it. Perhaps, that is due to the taste. If you eat the first leaves in early spring, you may be able to tolerate them with a little vinaigrette and some sweet onions, but let them go too long and they get rough and tough and bitter. In Biblical times and earlier, Chicory leaves were used as a spring tonic. Often blended with other spring greens like Dandelions (another very nutritious weed), this tonic would right the intestinal wrongs of a long winter fare of very dried pretty nutrient deficient foods. Indeed, we know today the root of chicory contains inulin, an indigestible carbohydrate that encourages beneficial bacteria in the intestinal tract, as well as many vitamins and minerals. The genus of Cichorium contains two important species: intybus and endiva. C.endiva is responsible for the salad greens we know as Endive and Escarole, of which there are many varieties of each on the market today. The C. endivas are gourmet vegetables that are cropped much like a lettuce, using only the above ground leaves. Sometimes these leaves are grown in the dark or blanched to make them sweeter. C. intybus encompasses our wild herb Chicory, Radicchio and Witloof (sometimes confusingly and erroneously alled Belgian Endive). These Cichoriums are also grown mainly as salad greens and can also be blanched or grown in the dark to make them sweeter. 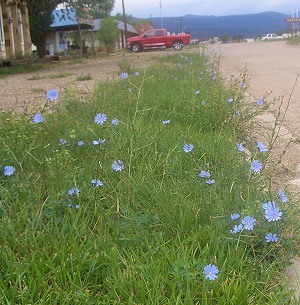 With so many different fancy Cichoriums, it is easy to see how the common Chicory that grows on roadsides has not garnered the respect it deserves. Cultivated for centuries, not only as a tonic herb but as a coffee additive or substitute, there must be a place in our garden for this humble plant with the beautiful blue flower. It is said that Chicory flowers may also be white or pink depending on the acidity of the soil. In the interesting little book Weeds and What They Tell Us, Ehrenfried Pfeiffer instructs that this flower not only indicates pH, but also the suitability of the soil to produce other root crops. Because Chicory produces a long tap root similar to a carrot, you should grow it in deep, loose soil to encourage plump roots. Growing it in a large box or container will make it easier to harvest. Chicory can be planted in the spring or the fall. Because the warmer it gets, the more unpalatable the leaves become, planting in the fall will give the plant a jump start for growth during the cool seasons. Roots may be harvested when they are good size. For fall-planted crops this may be early summer and for spring crops this would be mid fall. To harvest, it will be necessary to carefully dig up the roots instead of pulling them up by the leaves. After they are dug, slice them in half or quarters to make sure there is no dirt inside (similar to a leek). The thinner the slices the faster the roots will dry to a crispy brown. The process can be speeded up by placing the roots on low heat in the oven. After they are completely dry, grind and add to your morning brew. Start with just a little bit and increase the amount until you find the flavor that suits you. If you want to grow wild Chicory into little colorless lettuce heads, trim the leaves to about an inch and then dig up the roots, dry them off, and store in sand in a cool dark place for two to three weeks or longer. To force them to grow again, take a couple of roots, trim them to about the same length (for ease of planting) and place in a container that is about twice the length of the root. Fill the pot with a sterile medium, like peat moss, and water. Set the pots in a totally dark room or cover with another pot with no holes. In no time, you should have some blanched chicory heads. Chicory is one of the six plants chosen to be in our Biblical Herb Garden. 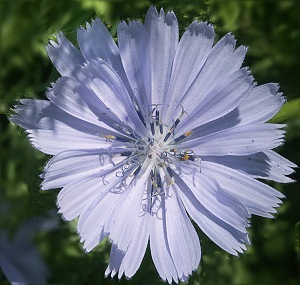 Chicory also makes a tasty addition to our Edible Flower Herb Garden Six Pack and our Small Space Herb Garden Six Pack. This plant is sometimes available in plug trays. These trays hold 128 of all the same plant. They are a great low cost way to fill a lot of space. Each cell is 3/4 of inch by an inch. Check here to see if Chicory Plug Trays are available.